We went to the library, and I couldn’t help but go searching for gardening books. We’re extremely fortunate to live in a city with a well-stocked library that has an excellent acquisitions department. “Are you going to read all of those?” my husband asked as I climbed into the car. My lap was full. They’re more for inspiration, research, and…just because. The Conscientious Gardener : Cultivating a Garden Ethic / Reichard, Sarah H.
The Week-by-Week Vegetable Gardener’s Handbook : Perfectly Timed Gardening for Your Most Bountiful Harvest Ever / Kujawski, Ron. A Complete Guide to Bird Feeding / Dennis, John V.
You Grow Girl : The Groundbreaking Guide to Gardening / Trail, Gayla. Homegrown : A Growing Guide for Creating a Cook’s garden in Raised Beds, Containers, and Small Spaces / Teegen, Marta. The Complete Book of Edible Landscaping / Creasy, Rosalind. 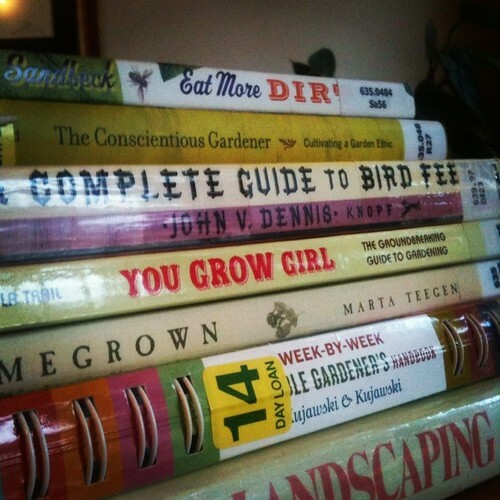 What are some of your favorite gardening books? What are some books that have stood the test of time? There is nothing quite like a good library trip.